Screenplay: Todd Phillips, Scot Armstrong, John O’Brien. Starring: Ben Stiller, Owen Wilson, Vince Vaughn, Snoop Dogg, Jason Bateman, Juliette Lewis, Fred Williamson, Chris Penn, Amy Smart, Carmen Electra, Richard Edson, Terry Crews, Paul Michael Glaser, David Soul, Will Ferrell. As film versions of classic Television shows go, this happens to be one of the most appealing, from “The Hangover” director Todd Phillips. The appeal comes from the fact that it sends up it’s original, rather than try and replicate it. 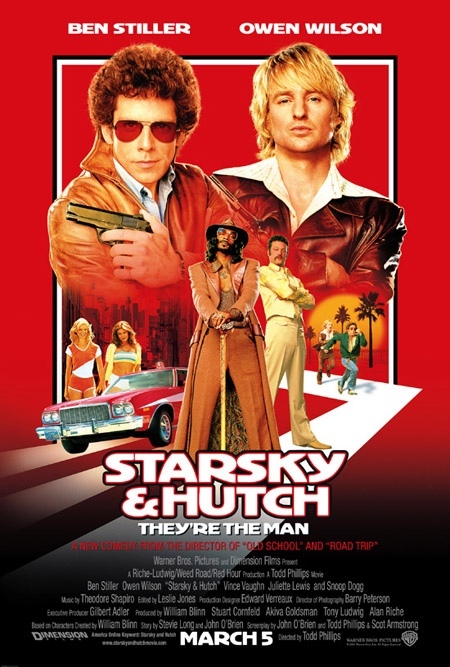 Detectives David Starsky (Ben Stiller) and Ken “Hutch” Hutchinson (Owen Wilson), have a lead on a new type of undetectable cocaine which takes them to the door of businessman and philanthropist Reese Feldman (Vince Vaughn) who they become determined to bring to justice with the help of street-savvy informant Huggy Bear (Snoop Dogg). The styles (complete with cardigans), the cars, and the haircuts are all here and they are all exagerated to fine comedic results. 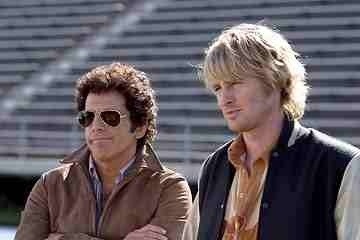 Wilson and Stiller are a fine comedy duo and this is probably the most suited for their double-act. They are both perfectly cast as the crime fighting duo with excellent support from a handlebar mustachioed Vince Vaughn as their arch rival, along with furry mustachioed partner in crime Jason Bateman and a perfectly cast Snoop Dogg, with some sharp lines, as the eponymous informant “Huggy Bear”. Already an iconic character, here he’s re-imaginned to delighful results. Although, I’m not a massive fan, the cameo appearance of hair-netted convict Will Ferrell, with an affection for belly-buttons and dragons is hilarious as he displays a “Midnight Express” desire toward Wilson. The film itself is not entirely laugh out loud material but it is mildly amusing and maintains it throughout it’s entirety. The main goal here, seems to be fun and that exactly what it achieves, throwing in an enjoyable cocaine-fuelled disco dance-off scene. Not normally my type film but its a good buddy-buddy cop movie that’s nothing more than light entertainment and works well, for what it is. This entry was posted on January 27, 2012 at 9:24 pm and is filed under Action, Comedy with tags 2004. You can follow any responses to this entry through the RSS 2.0 feed. You can leave a response, or trackback from your own site.